No doubt there are dozens of reasons people hire me to take them on a fishing trip on Lake Michigan. They want adventure, sport, to try something different. Perhaps fishing Lake Michigan is on their bucket list or they know it’s one of their best opportunities to catch a big fish, close to home. Some just like catching tasty fish or fish they can keep to eat without feeling guilty. Few people climb into the Brother Nature because they are on a quest. That’s what happened a few years ago when I met David Howard at the docks one morning in late June. David originally scheduled his fishing time to see how many fish of different species he could catch. Once he caught most of the species available in his home state of Virginia, he started traveling to other states to fish for other kinds of fish. Which brought him to me. My website (www.brother-nature.com) has a fishing calendar for people to use in planning when they’d like to come or what to expect when they get here. Howard saw the calendar and scheduled for late June when it's expected to get a mixed bag, each time out. Specifically, he wanted a lake trout, a steelhead or a coho salmon to add to his list. Catching even one of these three would be a successful trip, two of the three would be great and all three would be fantastic. Lakers were not to be. A cold front had pushed through leaving miles of 3 to 5 foot waves between the beaches and the deep water where lakers could be found. So we concentrated on nearshore, Skamania strain steelhead. 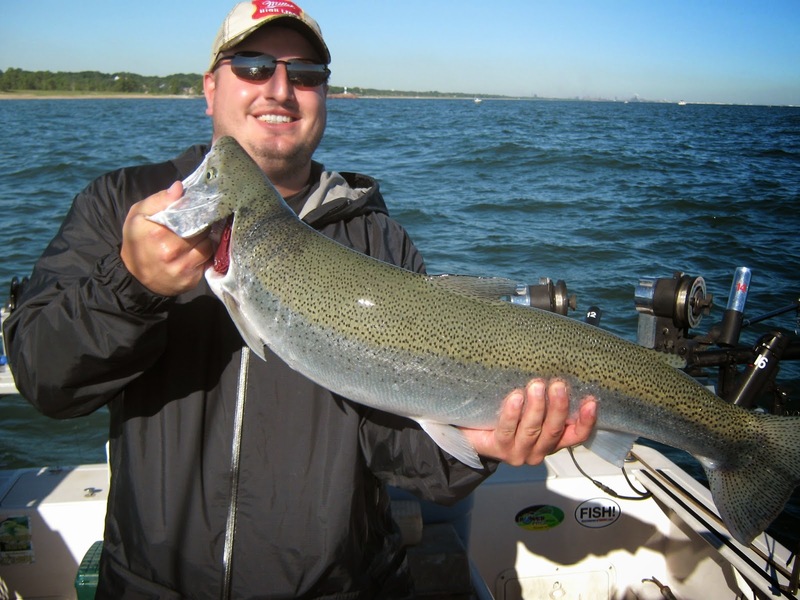 Success came quickly with a 14-pound steelhead. Next a brown trout came to the boat. Browns are rare in summer. He'd already listed a brown caught in a Virginia stream, but those fish are measured in inches. This one weighed over nine pounds, still his largest ever brown trout. The waves diminished by mid-morning. The lakers were still out of the question but I was able to steer the boat to slightly deeper and cooler water where Howard caught a beautiful coho weighing over seven pounds. Another fish for his "list." Soon after our outing a new quest was born. Howard realized his original goal to catch a variety of fish had taken him to more than half the states in the USA. Could he fish all fifty states? Not David's first brown trout, but his largest! It looks like it! A trip to Hawaii in 2015 will complete his journey. How many people can say they’ve visited all 50 states, much less fished all 50 states. In anticipation, Howard has set up a website www.fishingthefifty.com which includes photos from each trip along with a short essay detailing what fish he caught in each of the states. Click it up, it’s very interesting and he's caught some magnificent trophies. I’m happy and proud to have been a part of David’s quest. but hot action for smaller-sized fish. When the phone rings or I open my email and get a question from a potential customer it could be anything. I’ve been asked about bringing a newborn baby on board. I routinely get asked about what fishing license is needed. Where to meet? What time will we start? Sadly, that’s the toughest question a potential customer could ask. Let’s say the fall run of chinooks is going and the fish are active. The number of fish caught is dictated more by the amount of time it takes to boat one of these behemoths, then get set up for another pass through the staging area. At the end of the trip, it’s hard to get the cooler shut there are so many whoppers in the box. That’s got to be the best time to come, right? Perhaps. But perhaps the next day the fish are moody and we troll all morning and only get one or two bites. That happens with spawning run fish. Perhaps the group includes a petite mother and an eight year old child. They may not be able to handle the power of a full grown chinook salmon. Dad might like it, but the others would have had more fun in the spring catching more, but smaller-sized fish. I tell people “winter lasts until sometime in June on Lake Michigan. One day we need longjohns and gloves, the next day, it’s summer and hot.” That’s not far from the truth. The big lake is slow to warm and a day predicted to be “shirt-sleeve” weather ashore may require a warm jacket or more a few miles offshore. 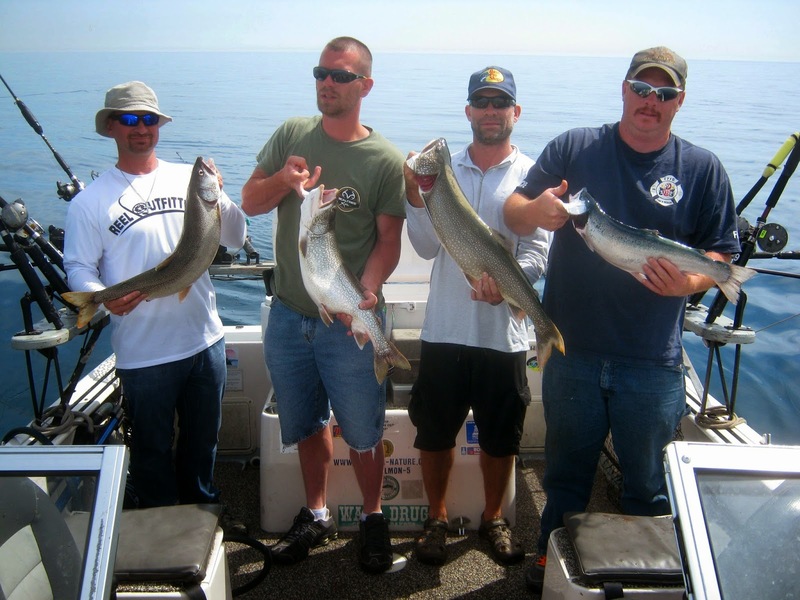 If the goal for your group is to spend an enjoyable, warm, sunny day on the lake and catch a few fish to ice down for dinner, a slow “catching” day in July or August may be your perfect outing. If your goal is to catch a limit of fish and you are a duck or deer hunter, accustomed to spending hours outdoors in chilly to downright cold weather, come in March or early April, and wear your cold weather gear. I had an individual who fished with me several times in early season and always caught a limit of cohos, browns or steelhead, but nothing big. Then he booked a fall trip to try for a mature chinook. He succeeded! In five hours he caught two big salmon over 15 pounds. Me? I like it all. I like the fact the fishing changes month to month as the season progresses. My advice? The best time to come is when you can. Bundle up if necessary. Wear shorts and flip-flops if you can. Catch the fish that bite whether that be in early March or late September. There are no bad times to give Lake Michigan a try. Most writers have experienced the “writer’s curse.” You head for a hunting, hiking or fishing destination and Mother Nature and Lady Luck team up to cast aside the best laid plans or make the hot bite cold as ice. 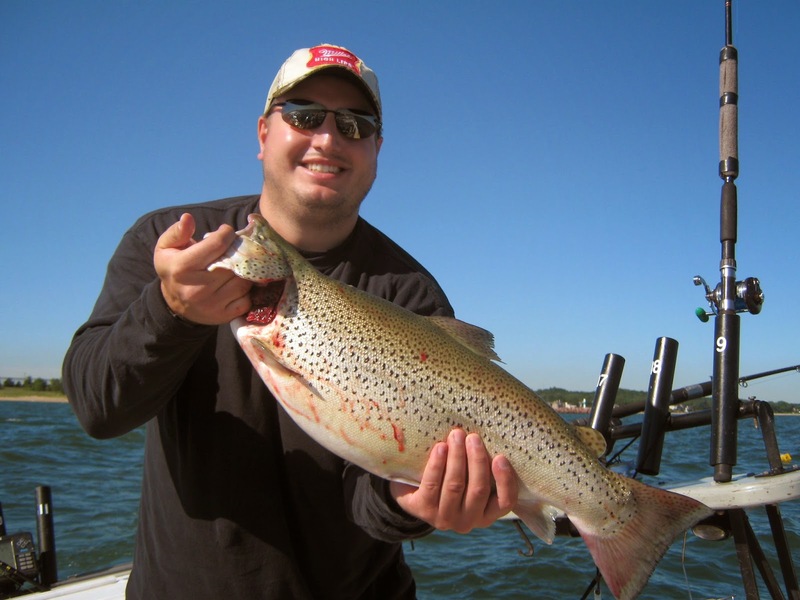 So it was for many of the anglers who headed for Chautauqua County, New York for the Association of Great Lakes Outdoor Writers annual “Cast and Blast” last May. 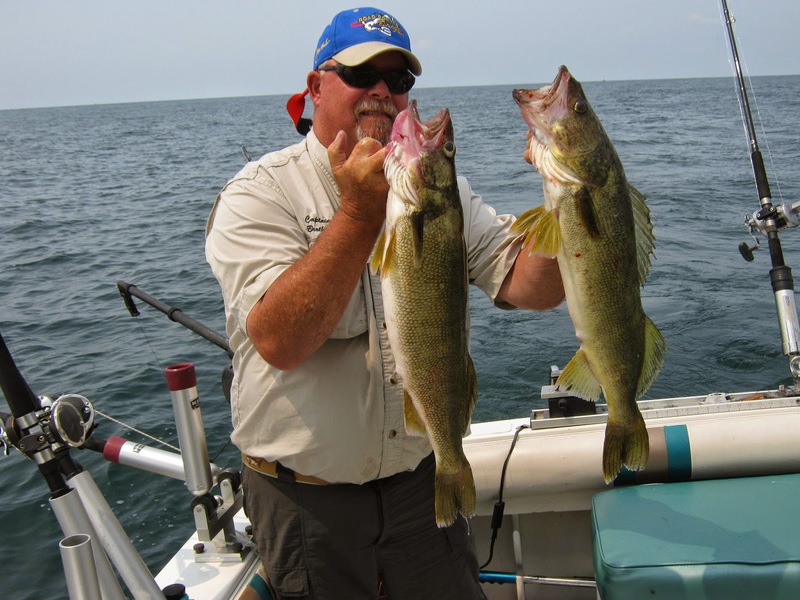 The prime fishing destination for the trip was to be Lake Erie with abundant walleye, smallmouth bass and other fish. Lake Erie looked more like a frozen daiquiri than a fishing destination with ice chunks the size of basketballs covering the surface. Lake Chautauqua, westernmost of New York’s famed finger lakes provided a great substitute but only a substitute for those of us wanting to fish Lake Erie. Western New York is beautiful country. Fields, forests, vinyards, Great Lakes and inland lakes. And good fishing whether you are an outdoor writer or not! After a perfect weather day and a few cooperative fishes, I was headed home. Southbound on I-65 in heavy traffic near Hobart, IN, a car pulled next to me, slowed and started honking. I glanced over and the driver was yelling and pointing back towards my trailer. It wasn’t the “hey, how are you doing” friendly greeting that occasionally happens. the price of the repair will be more than the price of the tow truck. I glanced in the side view mirror and immediately noticed I could see much more of the rear tire on the trailer than is normal. Immediately, I pulled over to the berm lane as far as possible but since there’s a guard rail, I couldn’t pull over as far as I would have liked. With cars and trucks whizzing by only a few feet away, I snuck back to see if my instant diagnosis was correct. Yep, bearing failure. I carry a spare wheel hub and tools with me when trailering. However, dragging the wounded trailer to the next exit without doing permanent damage to the spindle was unlikely and I’d have been killed trying to make the repair along the road. Luckily, when I renew my BoatUS membership, each year, I select the “Trailering Club” option. It’s a sort of AAA for trailer boaters. I called the 800 number, relayed the information to the BoatUS lady who answered and long story short, relatively soon a flatbed pulled up to load up the boat and trailer. Forty-five minutes later we were unloading at my house, worse for wear, but home where better tools and cold beer resides! The BoatUS dispatcher called with perfect timing, I handed my phone to the driver and in minutes, the deal was sealed. BoatUS paid him with a credit card, I owed zero! 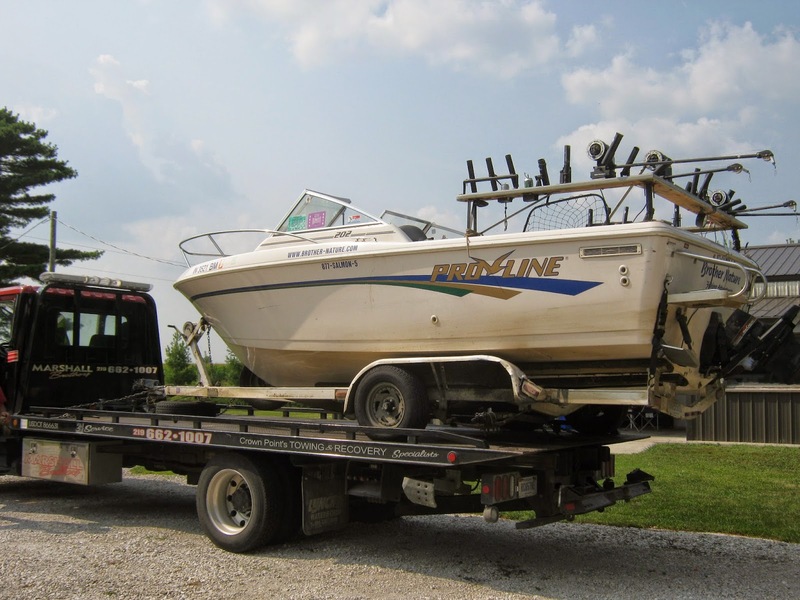 The BoatUS Trailering Club costs $14 in addition to the regular membership dues. I asked the driver what the bill would have been. Over $300. Money well spent. Even if you only live a few miles from the marina, think about the most inconvenient spot for you to have bearing problems, flat tire or some other mishap. Would $14 for help seem a wise investment? I don’t particularly like invasive species. Many are downright bad for the environment. A few have turned out to be interesting if not welcome additions to the outdoor world. Most are just “there” and either don’t bother much, are a mixed blessing or at least they don’t bother me much. Not so the Cercopagis pengoi, other wise known as the fish hook flea. Often when my lines are clogged with the almost microscopic animals there’s another “F” word used ahead of the name fish hook flea. Think of these little zooplanktons as tiny scorpions swimming in the water. As your fishing line drags through the water, especially lines pulled deep by downriggers, their up-turned “scorpion tail,” the fish hook that grows at the end of their tail for which they are named, snags on the fishing line. Indeed the little invasives from Southwest Asia are tiny. Having one on your line would go completely unnoticed. Having a million of them clinging to a hundred feet of line would hardly be noticed and probably not cause much grief to fishermen. 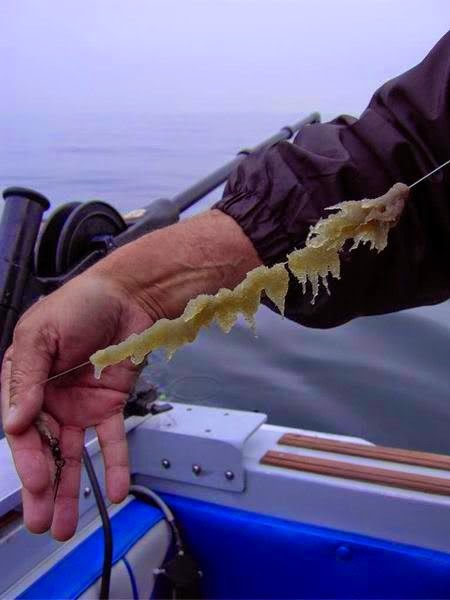 But drag a thin fishing line through the flea-choked waters of Lake Michigan in July and August when the flea-bloom is going full-tilt and it’s not millions or probably even billions of them clinging to a 100 feet of line. It may be trillions. In 20 to 30 minutes you line goes from being a thin thread dragging through the water to a quarter-inch-thick rope. Try to reel it in and there’s trouble. Try to reel it in with a fish on the line and it’s hectic and frustrating trouble. When the line is reeled, the FHFs clog at the tip guide of the fishing rod. At first, the line slides through the clog but as more line is reeled, the clog gets bigger and tighter, eventually gripping the line so tight no more line can be gained by cranking the reel. The fleas can be manually removed, but a good clog may take up to a minute to clean up. Then reel in another 20 or 30 feet, then stop and start flea-picking again. As I said, its annoying at best, and frustrating when there’s a salmon or trout on the line, hopefully hooked good enough that it’s not going to lose the hook while you are messing with the FHF. There are solutions. They aren’t good, but it sure beats putting up with the fleas. Some guys swear by Cortland Line's Flea Flicker Line and I've no doubt it works. It’s a flat line instead of round. Usually, having a bit of a twist in the line isn’t a good thing. With the Flea Flicker line, it won’t work without having some twist in it. 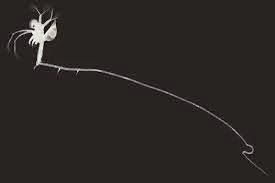 If a flea hits the flat side, it bounces off. If it hits the narrow edge, they will hook on, but the water pressure on them as they are towed along by the line causes them to slide down the line and when they rotate around the twisted line they just unhook and float away. Just as effective (and less expensive) for me is to switch to heavier line. Usually, spooling a top-shot of 30# mono on the 'rigger rods does the trick. The line is thick enough the "hook" on the flea-tails won't grab on. Last year, the fleas must have been larger and I had to move to #40.
are in this typical clump of fleas? I only spool 150 feet on each reel so a quarter pound spool will easily do all my ‘rigger reels for a couple years. That length will easily go from the rod tip to the downrigger release at the depths I commonly run my lures. Connect the heavy line to the lighter line with a double uni knot (go to www.netknots.com). I add a 20# fluorocarbon leader to any of the lines which will be pulling spoons, again with a double uni. If I'm using a dodger or flasher, I just tie direct. The downside to this is the increased water resistance of the thick line pulling through the water increases the sway-back of downrigger weights. With braid, I can hit the bottom in 100 feet of water by letting out around 110 feet of downrigger wire. When using 30# mono, it will easily take 130 feet or more, depending on how fast I’m trolling. It’s not as much fun to catch a fish on long lengths of stretch mono, either. The choice are pick fleas or catch fish. I’ll go with catching the fish. Conditions can be frigid in the spring. Each customer I take out on Lake Michigan gets either an email from me or a letter through the regular mail that gives them directions to the marina, advice such as “don’t forget sun screen,” and other tidbits of information. Among the tidbits is a saying I learned from my dad who was quoting my great grandfather, a man of whom I have only scant remembrance. Grampa Charlie’s advice is, “It’s better to have it and not need it than to need it and not have it.” Wise words and none better when figuring what kind of clothing to choose for a day on Lake Michigan. Conditions can be tropical in the summer. One of the advantages of fishing on the Brother Nature is it’s open and roomy for fishermen. One of the disadvantages is the same, especially the “open” part. If it’s sunny, you’ll be in the sun. If it’s cold you’ll be in the cold. So dress accordingly. And dress for the time of day you’ll be out there. If the high is predicted to be 90 degrees, light clothing is all you’ll need. However, if we are leaving the dock at dawn and it will only be 65 degrees at that time, you are going to be chilly in a tee-shirt and shorts. Don’t forget the lake affect, either. 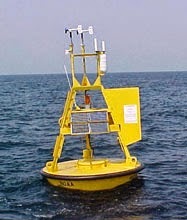 Ninety degrees on land doesn’t mean 90 degrees if we are 15 miles offshore in 64 degree surface water. If there’s much of a breeze, the on-board temperature may not exceed lower 70s all day. The weather forecast was for waves “about a foot” for last Friday and Saturday. 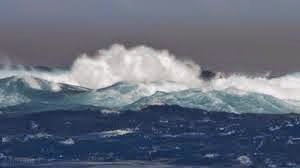 On Lake Michigan that can have waves over 20 feet high during gales, “about a foot” is a great forecast. Luckily, much of our early season fishing is nearshore where even if the evil winds are blowing, we can tuck in behind industrial breakwalls or stay nearshore where the seas will be kinder. But come summer, often it’s offshore 10 miles or more or nothing, so a calm mid-lake forecast is like a kiss from a pretty girl. The forecast for Friday and Saturday was off by about 8 inches. The waves never got over four inches! Back to back, flat calm conditions are exceedingly rare. The odd thing is how different the fishing was on those two days. This is what the lake looked like as we were motoring to the fishing area on both Friday and Saturday mornings. You can see how majestically beautiful it was just after sunrise and it stayed that way all day, both days. And on Friday, the fish loved it! The first fish bit while I was setting the third rod. A magnificent lake trout, Lake Michigan’s native apex predator came to the net. Then another and another and another and.... In short order, we had our laker limits and I pushed our trolling speed up, switched to lures more conducive to catching steelhead or salmon and the lakers continued to slurp up our baits. We did have one steelhead bite, but it threw the hook on it’s second aerial display. I figured the next day was a slam dunk. No weather changes, I knew where the fish were, another great weather day. Ah, but the fish gods weren’t smiling! This is my "should have been here yesterday crew" from Saturday. These guys are smiling because of the weather but what you see is the total catch. Three (nice) trout and one decent steelhead. We had a few other bites but a fish not caught is not counted for the most part. As the sayings go, "that's why it's called fishing, not catching," or "the fishing was great, the catching was slow," or "A bad day of fishing is better than a good day at work." I have lots of experience in taking fish photos. They are called “hero shots” where the lucky angler who has caught a photo-worthy fish stands, gripping and grinning, fish in hand and the photo is snapped. Most hero shots look, well they look contrived. Sure it’s a lasting tribute to both fish and angler of the size of the fish and the smiling face of the fisher-person. On the other hand, it’s a picture of a mope with a dead fish-or nearly dead. Professional photographers leave little to luck. They understand what’s going on. They prepare the scene, adjust the lighting and leave little to chance. Amateurs rely on luck. 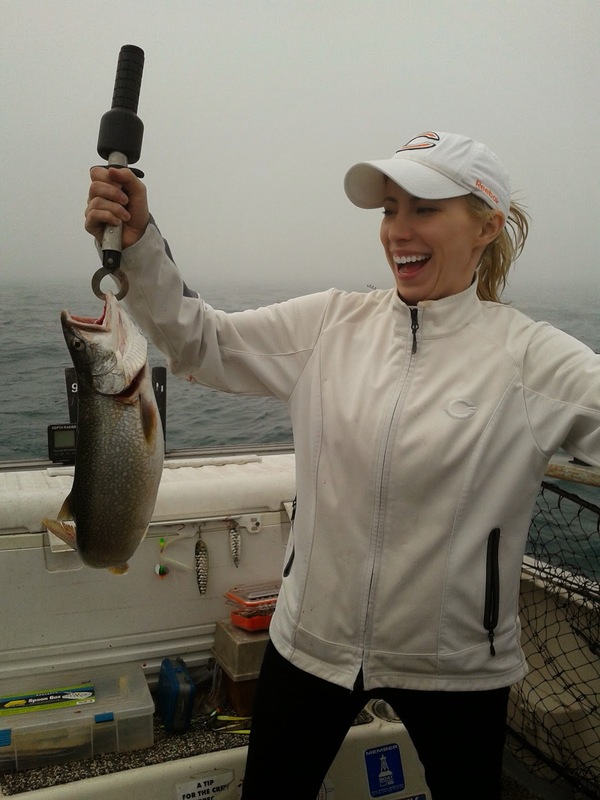 Liz caught a nice lake trout on my boat and she handed her dad the camera to do the classic “grip and grin” photo. Since we were in the “photo” mood, I grabbed my own camera to take a happy-snappy of my own. The first time I pressed the button, the fish, still lively, waggled a wiggle. In the tiny view screen on the digital, I could see the fish wasn’t properly displayed. So I told Liz to hold it up once more for another shot. She complied. Back at home, downloading the photos from the camera to the computer and able to see the photos in large size instead of a tiny LCR on the back of the camera, I realized Lady Luck had given me a blessing. The second photo showed a bored young lady with an apparently dead fish and an apparently fake smile staring at the lens. The first photo, however, showed a beautiful young lady with a real smile coping with a lively fish. A million times better in my book! Don’t you think so, as well? Another way is to “plank” it. The result is a marriage of smoked salmon (delicious) and grilled salmon, equally delicious. Grilling planks are available in many places. Bass Pro Shops and Cabela’s have them, or get them on-line from Amazon.com. The idea is simple. Lay the fish on the plank instead of just on the grill rack. Then lay the plank on the grill rack, shut the lid on the grill and let it cook. There are some preparatory chores before the final cooking. First, soak the plank in water. Cedar (the most popular plank) is a soft wood and will ignite easily. You do want the plank to burn eventually, but not instantly. Submerge the plank in a shallow pan of water for several hours. I like to keep my grilled salmon simple so all I use is a bit of Lawry’s Seasoned Salt as a rub. If you have a favorite such as lemon pepper or other seasoning, have at it. Once I have the filets trimmed, skinned and all the pin bones removed, I give it a light dusting of Lawry’s, top and bottom, pat the salt onto the meat and put in the refrigerator for an hour. Take the soaked plank from the water, rub a bit of cooking oil on one side then arrange the fish on the plank. I add a bit of fresh or dried dill to pep it up a bit. Then put the plank over the hottest part of the grill. The plank will deflect most of the heat, preventing the fish from cooking too quickly. The wet wood resists burning because it’s wet. In essence, this initial cooking phase steams the fish. Ideally, about halfway through the cooking process, the plank will dry to the point it starts to smolder and produce smoke. This is the smoke flavoring part of the cooking process. Once the plank starts to smolder, turn down the heat and let the fish finish cooking slowly. Total cooking time is roughly 15 minutes. Don’t overcook. Remove the fish to a serving platter, douse the plank to put it out and dinner is served. As of mid-February, all five of the Great Lakes are “officially” frozen over. In actuality, they were 90% ice covered, but when they hit that level, the people in charge of observing Great Lakes ice conditions proclaim them to be totally frozen. The last time the lakes were frozen completely was in 1994. Few lakes in the upper Midwest completely freeze in the winter. Springs, muskrats, wildfowl, stream inflows, pressure ridges and other factors often produce areas with thin ice or even open water. 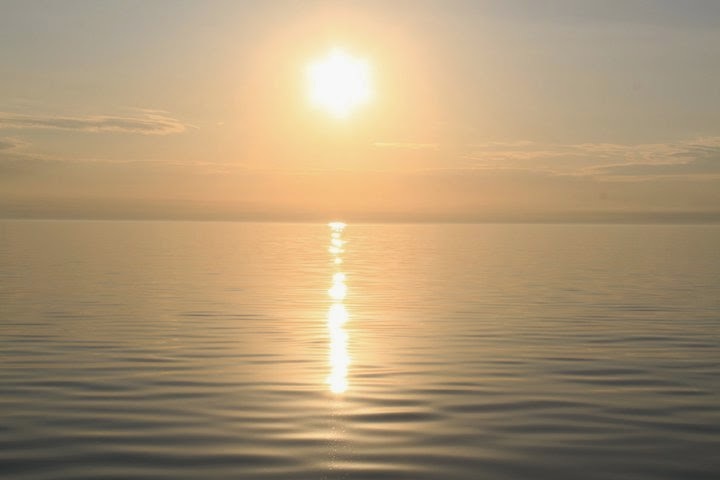 In the Great Lakes, unfrozen areas can be the result of currents as in the Straights of Mackinaw, St. Mary's River, Detroit River, Niagara River and a few others. Industries and lake shore power plants discharge heated water in other areas. There can be wind-driven openings in the ice similar to pressure ridges that occur on inland lakes. 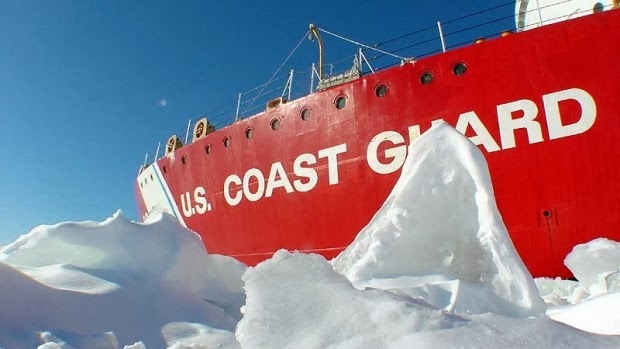 The U.S. Coast Guard operates a fleet of ice-breaker vessels on the Great Lakes. There's our tax dollars at work! In some areas tug boats and other vessels do ice breaker duty to keep industrial harbors in action. 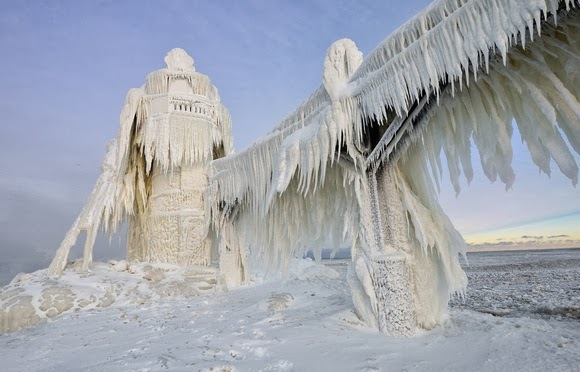 There are two silver linings to the frozen Great Lakes. Winter evaporation from unfrozen surface water in mild winters is one factor creating what’s become chronic, even record low lake levels. Related to the evaporation from the unfrozen lakes is, once the lakes are frozen, the lake effect snow machine is shut down. The upper Midwest is getting enough snow to satisfy most people without the lake snow this winter. Will this have an affect on the fishing next season? Maybe a late start to the action.... Maybe it will drive more fish down to MY end of the lake.... Hope so! There's only one way to find out. The fun way. Let's go fishing !